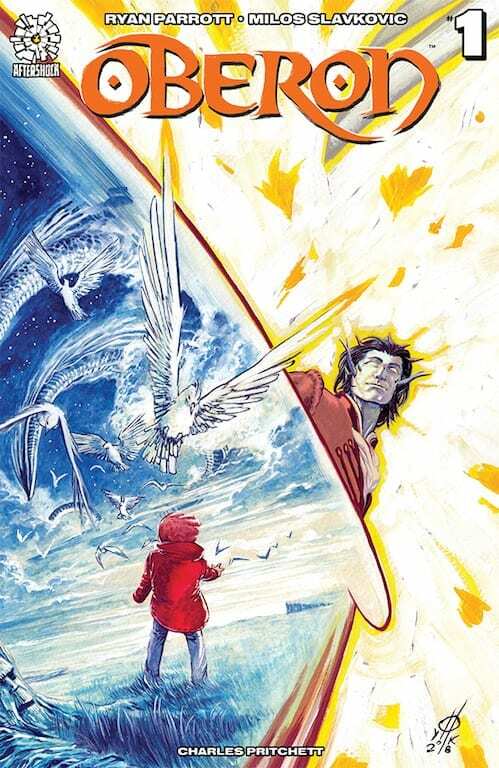 With a strong central character and an intriguing mystery, Oberon #1 is a solid first issue. The lack of interesting supporting characters is overshadowed by the clever design work and panel layouts. 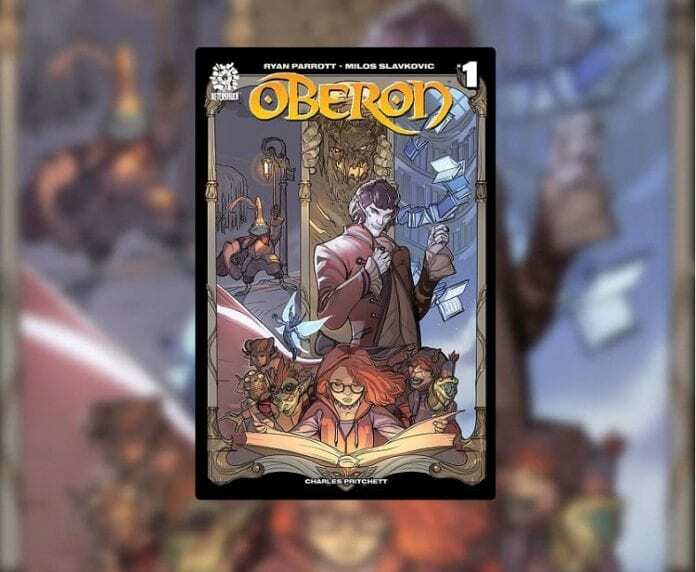 AfterShock Comics continue to broaden their range of comics with Sci-Fi, Adventure, and fantasy titles, like their new fairy tale-esq story Oberon. Following in the footsteps of franchise favourites like Labyrinth and The Sandman, Oberon blends classic fantasy elements with modern characters and settings. The creators have chosen a famous character as their central protagonist which instantly brings a number of comparisons. But have they managed to break away from their contemporaries or are they stuck in the shadows of great masters like William Shakespeare? The adventure begins with the tale of a guard watching over The Light of the Always, protecting the fantasy realm from an unseen evil; The Nevermen. The story then quickly shifts to modern day San Francisco where the reader is introduced the smart, but socially oblivious, Bonnie. The youngest in a family of four, Bonnie’s life is about to take an extraordinary turn thanks to the heroic entrance of Oberon, a larger than life fantasy prince. Writer Ryan Parrott adopts a tried and tested approach to his fantasy story involving the king of the fairies. He introduces the Fairy world through the concept of a myth before giving the reader a grounded, identifiable character surrounded with all the trappings of the modern world. The reader is given a taster of a mystery before living a day in the life of Bonnie. This allows the reader to be easily led into the fantasy elements of the comic so that any culture shock can be controlled by the creators. This is an approach used by some of the greatest writers, including William Shakespeare and Alan Moore. It is also an approach used by some of the greatest family films ever made: Labyrinth and The NeverEnding Story to name just two. Parrott centralises the narrative around the character of Bonnie. He sets out her own understanding of her life then forces her to question everything. This instantly creates an intriguing character development which unfolds from page to page, progressing naturally in front of the reader. It also acts as the hook to draw the reader into this familiar yet new world. Bonnie is a well-rounded character that Parrott gives an amazing voice to. She is smart, funny but also has a vulnerable side which is instantly identifiable. The other characters in the tale don’t have this roundness to them, even the titular character is lacking something. He has a strong physical presence but his character is a little underwhelming at this early stage. The artwork in contrast to some of the characters in Oberon has outstanding presence. Milos Slavkovic gives the visuals a theatrical flair befitting the myth status of the story. The opening sequence looks as if it has been edited directly out of the movie Labyrinth, and that is meant as a compliment. Flowing from one panel into the next, the characters fill up the scenes with emotion and wonder. Slavkovic draws impressively expressive figures who perform their role like the greatest modern Shakespearian actors. Each page of Oberon has a staged sensibility which adds to the overall theme of the narrative. The design work on the panel boarders also adds to the theatrics, easily separating the ‘real’ world from the fantasy realm in a way that is both functional and decorative. It is in these details that the magic of this comic shines through. 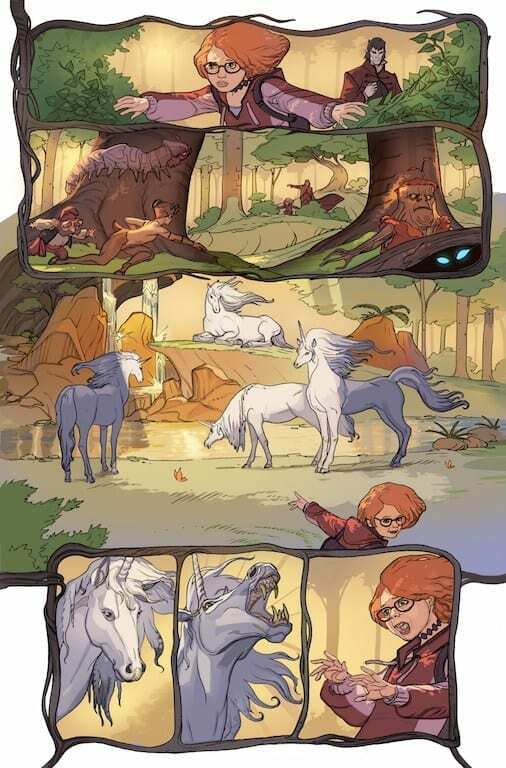 In co-operation with the letterer, Charles Pritchett, the creators of Oberon have crafted an expressive and intriguing world full of wonder. The design on the panels and the speech balloons create the other worldly feel that is ever present, even in the modern cityscapes. When the magical meets the regular the contrast is reflected first by Pritchett’s lettering choices. It is too easy to make comparisons between this and the more famous depictions of Oberon. 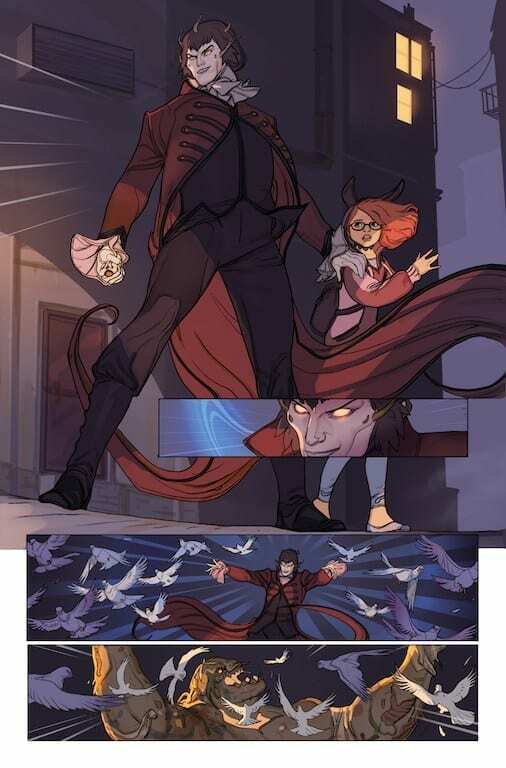 However, AfterShock Comics newest interpretation has concentrated on creating a mystery surrounding the titular character while giving readers a new take on DCs Tim Hunter from The Books of Magic with the character of Bonnie. A lot of the broad content from this comic is treading old ground but the tale is in the telling and Parrott, Slavkovic and Pritchett have woven a wonderful and intriguing tale of childhood adventure.